How do you tell what is real and fake news during the election season? On Tuesday's St. Louis on the Air, we'll hear from media literacy educators about some strategies. 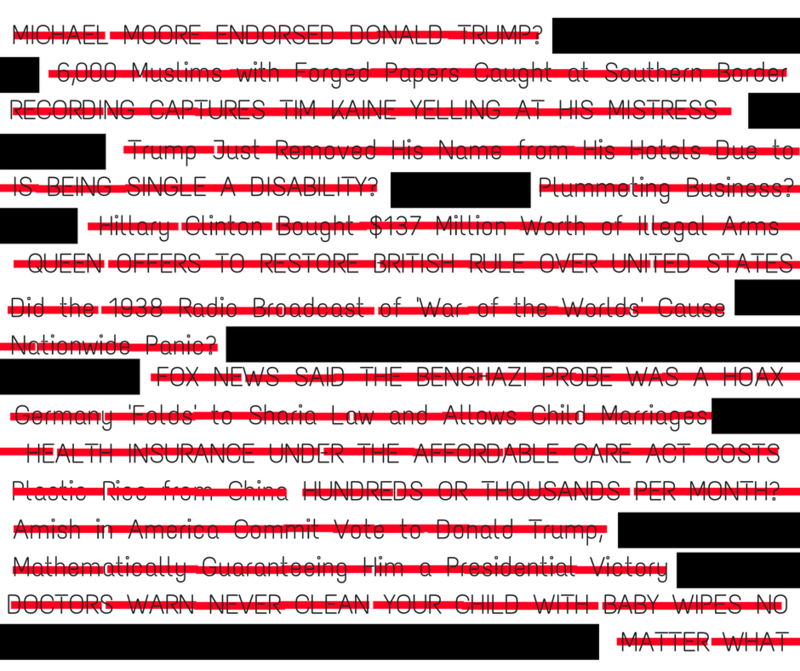 These are all "fake" news headlines pulled from Snopes.com. You’ve seen it in your newsfeed before and perhaps even clicked on it or shared it: a bogus “news” story related to the election. While Facebook and other social media sites have worked hard to limit the reach of such stories, some still seep through the cracks. Snopes, a website dedicated to debunking such stories, gives a good summary of the internet’s worst offenders for production of such stories here. But how does a normal person parse out what is real and what is fake? On Tuesday’s program, one week out from the election and as part of Media Literacy Week, we discussed media literacy and what you need to know about news sources to trust, especially in light of election season. Joining the program was Julie Smith, a media literacy educator and author of “Master the Media: How Teaching Media Literacy Can Save Our Plugged-in World” and Natasha Casey, professor of English and Communications at Blackburn College. Election 2016 has been rife with "news" from fake news sources. How do we tell the difference? A discussion about media literacy. 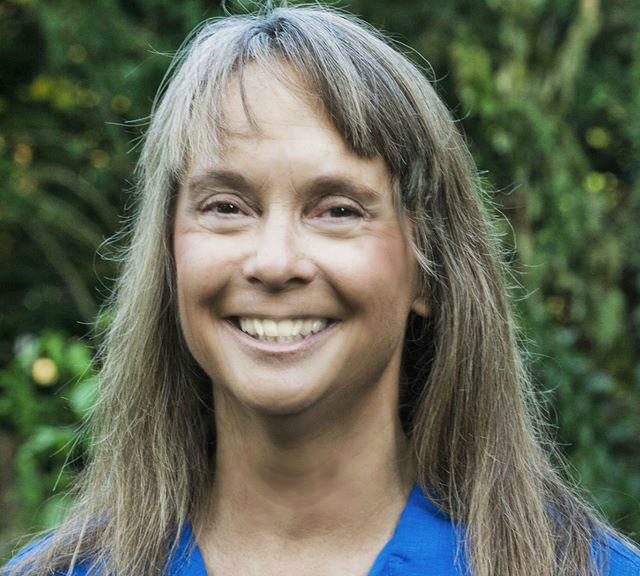 Julie Smith wrote the book "Master the Media: How Teaching Media Literacy Can Save you Plugged-in World." Social media sites, of course, have changed up traditional information delivery structures, but these considerations still apply. If it seems too good to be true, it probably is. The impact of changing information sources can be seen among millennials, typically thought of as “digital native” members of the population and older generations. Natasha Casey is a professor of commnications at Blackburn College. Not so fast, said Natasha: older generations are often easily duped by false sources online as well, sharing spam or news from fake/satirical sites without realizing it is not a legitimate new source. Google reverse image search helps you determine the origin of a photo to see if it has been photoshopped or repurposed with fake information. Look out for copious spelling errors, a big giveaway a site may not be everything it says it is. If you see something that you think may be too good to be true, use Snopes.com to research the validity of internet folklore and stories. Smith said that the website draws 300,000 hits a day and she gives it an “A+” rating for its apolitical nature. Keep an eye out for satire: make sure the source of your information is not a satirical website. While places like The Onion openly broadcast the mocking nature of their website, other sources may not be so upfront. For more political facts that need to be looked into, Smith recommends Politifact and Factcheck.org. Melissa Zimdars, an associate professor of communication at Merrimack College in Massachusetts, compiled this list of websites known for sharing "false, misleading, clickbait-y and/or satirical news." It is worth looking through to see if you gather "news" from any of these sites. Finally, help educate the people in your life about the prevalence of internet scams and fake news. For younger learners, Casey recommends Project Look Sharp, which provides lesson plans in media literacy techniques for K-12 grades in a variety of classes from science to health to global studies. What: "Local Media and Informed Voting"
When: Wednesday, Nov. 2 from 7 to 8:30 p.m. 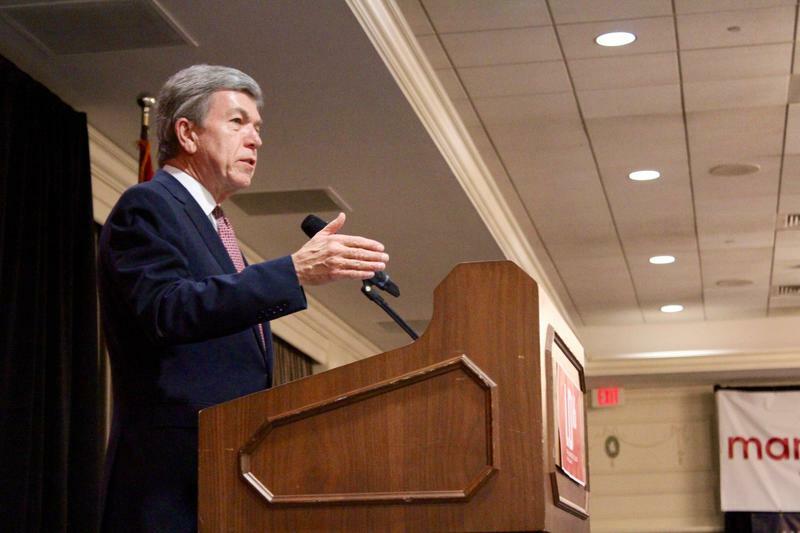 In the early years of his political career, U.S. Sen. Roy Blunt had a reputation as a reformer. In 1992, Blunt — then Missouri secretary of state — ran a stunning ad that accused fellow Republican Bill Webster of engaging in “pay to play” in the Missouri attorney general’s office. In this election year, much of the dialogue between Democrat Hillary Clinton and Republican Donald Trump has been particularly harsh. Both candidates for president of the United States have taken turns hurling accusations of illegal or immoral behavior at one other. The verbal assaults, frequently discussed in decidedly “adult language," have left some likely voters wondering what ever happened to common decency and common sense. What, then, are parents supposed to do, when their children hear talk and see actions that in no way set examples of how reasonable people should behave?